From 20 march - 22 march: Henri and Maria Theresa visit Belgium for a 3 days visit! Post here all news and photo's! Yes, a state visit. I'm also looking forward to this. The Belgium RF really needs something big like this. And it is also a Family visit. King Albert II is the uncle of HRH The Grand-Duke. Will the children (if not Lorenz & Astrid's, then Elisabeth, Gabriel, Emmanuel, Lousie and the twins) be going? So, maybe Maria-Laura & Amedeo? I'm going to close up this thread until the date of the State Visit is nearer. This thread has now been re opened. Please do not linked the photos directly. Hotlinking is strictly prohibited. What is the purpose of this (or any) state visit? Anyone know? Somebody knows the program of the visit? Does anyone know which Belgian Royal Members will be attending this event? Visite d'Etat de Leurs Altesses Royales le Grand-Duc et la Grande-Duchesse de Luxembourg. yea!!!! goods news!!!! I hope many fhotos people!!!... luck!!! There is a program of the visit in French on the Gouvernement du Grand-DuchÃ© de Luxembourg - Informations et actualitÃ©s website. It would be great if someone could translate it into English. Around noon, King Albert II and Queen Paola will receive Grand-Duke Henri and Grand-Duchess Maria Teresa at the Place des Palais in Brussels. There will be military honours and the Luxembourgian delegation will be presented. The Grand-Duke and Grand-Duchess will then head for the Tomb of the Unknown Soldier for an act of homage. After returning on the Royal Palace, there will be a private lunch with the King, the Queen, Queen Fabiola, the Duke and Duchess of Brabant and also Princess Astrid and Prince Lorenz. In the afternoon the Grand-Duke will have a meeting with Prime Minister Guy Verhofstadt, also on the Royal Palace. After this the grand-ducal couple, accompanied by the Belgian royal couple, will be welcomed on the Grand-Place by the Mayor and Aldermen of Brussels, for the traditional meeting with the city's authorities. The Grand-Duke will then go to the Maison du Grand-Duché de Luxembourg which is build in the Quartier Européen, for an informal meeting with the Luxembourgian community in Belgium. In the evening at the Château de Laeken a dîner de gala will be the closure of the first day of this visit. The diner is offered by the King and Queen. The Grand-Duke and Grand-Duchess, in attendance of the Belgian royal couple, will visit the city of Bruges in Flanders. They will be welcomed by the Governor of the Province and by the Mayor and Aldermen of Bruges. After a brief passage at Bruges' City Hall, the Grand-Duke and the King will visit the Port of Zeebrugge, the world's largest port for the transportation of new cars and one of Europe's major terminals for natural gaz. The Grand-Duchess and the Queen will visit the School for Lace in Bruges and attend an informative meeting. They will also visit the Lace Musuem, adjacent to the school, which was created by the Sisters Apostolines in 1717 . The Grand-Duchess and the Queen will also visit the exposition Albrecht Dürer – graphiste génial de la Renaissance at Arents House and La beauté et la folie at the Church of Our Lady in Bruges. 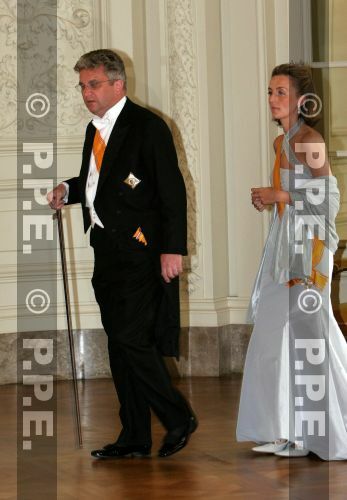 In the evening the Grand-Duke and Grand-Duchess will host a reception in honour of the King and Queen. 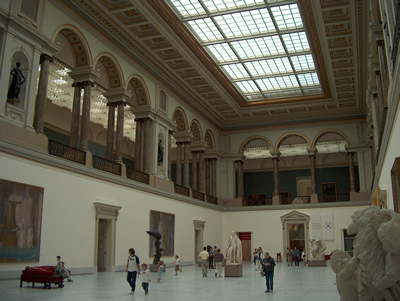 The reception will be held at the Musée des Beaux-Arts in Brussels. The Grand-Duke and Grand-Duchess, in attendance of the Belgian royal couple, will visit the city of Namur. They will be welcomed by the Governor of the Province and by the Mayor and Aldermen of Namur during a reception at the Théâtre Royal. The grand-ducal couple and their Belgian hosts will then visit the Université Notre-Dame de la Paix de Namur. The last stage of the State Visit will be held in the Province of Liège, in Eupen, the centre of the German-speaking community in Belgium (nine municipalities with German as native language). The Grand-Duke and Grand-Duchess will say farewell during a short ceremony and head for Luxembourg again. Will they be included in the visit? Also what duties does Princess Claire have? Most likely Prince Laurent and Princess Claire will attend the Dîner de Gala given at the Château de Laeken. And most likely they will also be invited for the Concert in the Musée des Beaux Arts in Brussels. The Grand Duke is a nephew to the King (son of the King's late sister Grand Duchess Joséphine-Charlotte). The Grand-Duke therefore also is a cousin to Prince Philippe, Princess Astrid and Prince Laurent. Prince Laurent and Princess Claire hardly have any public appearances. They are low in the 'pecking order' and that becomes clear in the public representation as well. They come after the royal couple, after Queen Fabiola, after the Duke and Duchess of Brabant and after Princess Astrid and Prince Lorenz. Tomorrow we go to see Mathilde that good!!!! Why would Princess Claire And Prince Laurent come after Lorenz and Astrid? As Laurent is a son of a reigning monarch, he should by rights "outrank" his sister, and she should come after him in any official function. Or am I totally wrong?